Since it’s the biggest state in the union, Alaska can get away with having more than one state fair. Here is a roundup of three of the bigger fairs around the state. The 12-day festival is the biggest of the state’s fairs and was officially designated the Alaska State Fair in 1956. 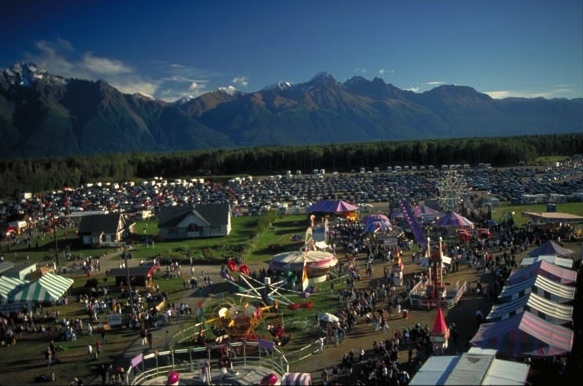 The fairgrounds are in Palmer, about a two-hour drive from the Mt. McKinley Princess Wilderness Lodge. It features large livestock and agriculture exhibits and contests for everything from karaoke to text messaging. Some of the performers at this year’s event include Chevelle, a Rat Pack tribute group, country musician Craig Morgan, comedian Gabriel Iglesias and radio personality Garrison Keillor (full list here). Tickets: $5-11, with additional fees for some performances. The “Biggest Little Fair in Alaska” is hosted in Ninilchik, a small town on the Kenai Peninsula between Homer and Soldotna. It’s only about an hour and half drive from the Kenai Princess Wilderness Lodge in Cooper Landing. The fair features performers and a full range of livestock and agriculture displays as well as sewing exhibits. It is also home to a two-day rodeo with events ranging from calf riding to roping and milking. Dates: Aug. 19 – 21. Founded in 1924, the Tanana Valley State Fair is the oldest fair in the state of Alaska. The event celebrates Interior Alaska and is hosted in Fairbanks, so the Fairbanks Princess Riverside Lodge is a natural fit for an overnight stay. The fair features livestock, games, rides, art and crafts, competitive exhibits, quilt shows, and two outdoor stages with free entertainment. Some of the more popular events include a Lego contest, antique tractor pull demonstration and baby show.